9 inch diameter. 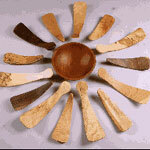 The solid wooden bowls are turned while green and then kiln dried to insure that they won�t crack. They all have a food safe finish. After using just rinse with soap and water and dry. Hand crafted by Spencer Peterman.